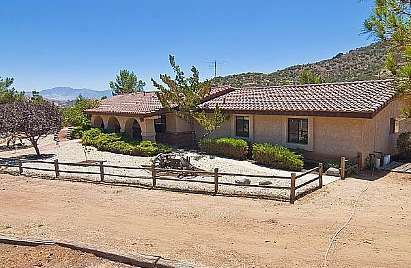 Fantastic STANDARD SALE 2 acre horse property! Main home is 4BR+3BA, almost 2,500 sq/ft. HUGE RV garage/workshop is almost 1,000 sq/ft with 3 roll up doors. Barn has 5 stalls and tack room! Home features new carpet & paint, gorgeous solid oak cabinetry, large open floor plan with 2 fireplaces, formal dining area, wet bar, family room and living room, mud room, attached 2 car garage, and 4 good size bedrooms. Property also features a horse arena and pasture, and covered storage space behind shop (shop could be expanded!). Plenty of room for all of your pets and toys, and still plenty of space left over to utilize as you like. Gated entry, covered patio, dog kennel, and drip system irrigation, there's a lot to take in! If you like wide open spaces, this could be for you!